Catering Items exist in the Catering Module and are the items that will make up the contents of the Catering Menus, and Catering Contracts. 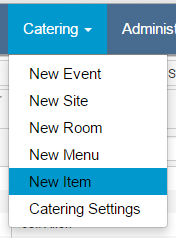 Catering Items can be created three different ways: from an existing Purchased Item / Recipe, from the New Item option in Catering options, and on-the-fly while working on a Catering Event. 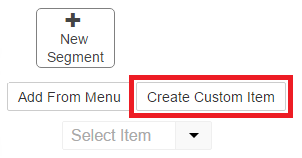 We will demonstrate the three methods of Catering Item creation, and detail the Catering Item record. The saving of Catering Items is the same no matter how the creation of the Catering Item is initiated, so below we will detail the three methods to create the Catering Item, followed by the Catering Item record and how to save a new Catering Item.